Ultimate Windows Tweaker is an application created for ptimizing Windows Vista, Windows 7, 32-bit & 64-bit. It can simply be downloaded and used as a portable application to customize your Windows Vista to meet your requirements. With judicious tweaking, It can make your system faster, more stable, and more secure with just a few mouse clicks. 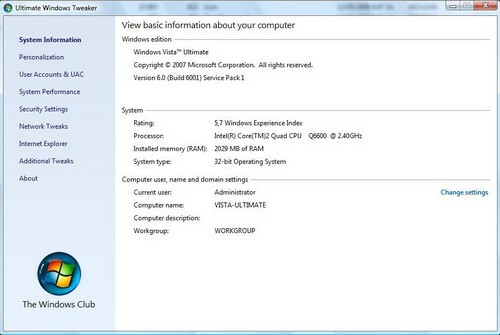 The tweaker detects whether you have IE 7 or IE 8 installed and accordingly offers you the relevant tweaks only. The utility has a simple easy-to-use user interface, with the tweaks being classified in separate heads based of their functionality. Most tweaks are hidden inside Vista, and what this tweaker does is to try and put the useful one’s in one place. · All about Windows Command Line, Batch Files, and Scripting in Vista. · Unravel Tweaks & Settings buried inside Vista’s Group Policy Editor. · Make your Vista send you e-mails using Task Scheduler! · BitLocker Feature in Vista. · De-Mystifying The Windows Vista Registry.